Last week I attended the Natural and Organic Products Europe trade show at Kensington Olympia (thanks to Helen of Fuss Free Flavours for the heads up) where I was generously given a sample of The Raw Chocolate Co bars to review. I love chocolate, and I mean really love. Nothing can touch the sensation of a piece of unadulterated chocolate melting on the tongue, and to me that’s what it’s all about. If I want to satisfy a sugar craving I seek cake, but if I want to savour something that just happens to be sweet, to have a nice treat with an afternoon coffee, a couple segments of quality choc is where it’s at. To me chocolate is something to appreciate, and appreciate it I do. And I can really get behind appreciating these bars by The Raw Chocolate Co (like reeaaaaallly really). It’s so hard to avoid sounding pretentious when describing something good. Sorry. But seriously, it is. Now for a run-down of the flavours. Chocolate purists will most appreciate the pitch dark bar, comprised of 72% raw cacao solids and sweetened with coconut sugar (a sustainable body-and-environment-friendly alternative to cane sugar). It’s often all too easy to attribute too much bitterness to commercial dark chocolate, but somehow these guys manage to take that edge off, creating a perfect balance between bittersweet and the tangy undertones any good dark chocolate should possess. Like its parent bar, the Goji Berry and Orange Bar also contains the same high levels of cacao, complementing its rich intensity with orange essence and goji berries. The orange flavour is fairly subdued, so instead of a citrus bar with a vague implication of chocolate it’s a quality chocolate bar with a suggestion of orange. Many other brands I’ve tasted have failed to get that right. Goji berries have never done anything for me, but I like the texture they impart in this bar. The Raw Chocolate Co offers two chocolate bars with no added sugar: Dark Raw Chocolate with Mint and Dark Raw Chocolate with Orange. Like its coconut sugar cousin with goji berries, the orange tones in the latter bar aren’t at all overpowering. The same goes for the mint, although I must admit this is probably my least favourite of the bars (but a disclosure: I will rarely opt for mint chocolate in any circumstance save ice cream – holy cow that’s what I’m going to make with this. Score). Both are sweetened with xylitol derived from birch (I have no idea how that works, but it sounds mighty neat) and are comprised of 70% raw cacao solids. The texture of these bars is slightly smoother and, while I had my doubts about using xylitol as a sweetener in chocolate, I think it works. Ideal if you’re looking for low glycemic index sweets (xylitol ranks at an impressive 8), this sweetener also keeps the dentist happy. Yes, yes, the bars are all vegan, but super creamy and smooth just like rich milk chocolate. The Organic Vanoffe bar (which my partner likened to Caramac bars he had as a child), sweetened with both coconut palm sugar and malty-sweet lucuma fruit, is more akin to white chocolate (there are no cacao solids), but still has a subdued chocolatey taste. It is, hands down, one of the most unique chocolate bars I’ve ever tasted, and I mean that in the most complimentary way possible. Claimed as a “naughtier version” of the vanoffee bar, Vanoffe Dark is made with 55% cacao solids and I can’t begin to put into words how amazing this bar is (in fact I think it may become my go-to milk choc). The taste of natural vanilla is stronger in the light vanoffee bar, where it comes out as an almost caramel-y, whereas with the dark it’s more of a hint that lingers. Talk about a stellar aftertaste. It might be time to ditch that pretentious attitude that came out initially in this post, buy this in bulk, and spend an evening with Bridget Jones (okay, more likely Todd Solondz, but you get my point). 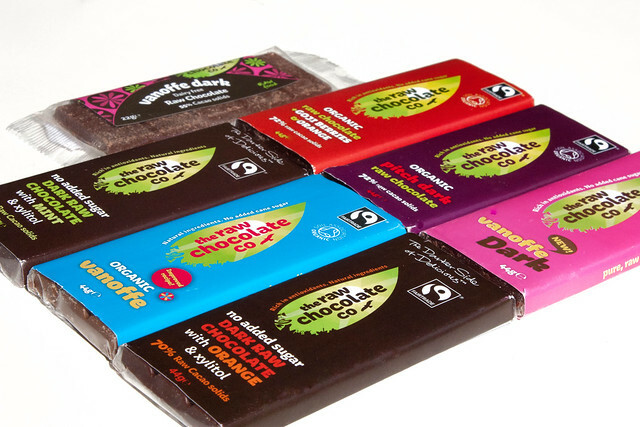 Check the website for a list of stockists and go buy some of this amazing chocolate! All bars come in both 44g and 22g sizes, are made with all natural ingredients, sourced ethically, and are raw. The company also sells a range of other products, including cacao butter, lucuma powder, chocolate covered berries, and more. The Raw Chocolate Co can also be found on Facebook and Twitter.